Idiro Technologies, a leading provider of advanced data analytics for enterprises, today announced it is to speak at the 2013 Global Summit on Number Portability. As described in a recent Idiro blog post, Mobile Number Portability (MNP) is an important topic for nearly all mobile telcos. Many countries allow customers to switch operators and keep their number. Among those countries that have not implemented it yet, many are working towards implementation. MNP is important for telecomms markets because it removes a bar to switching that keeps those with much equity in the number – in particular many business users – prisoner behind a high switching barrier. The reduction in barriers to switching is of particular benefit to challenger operators against dominant incumbents. 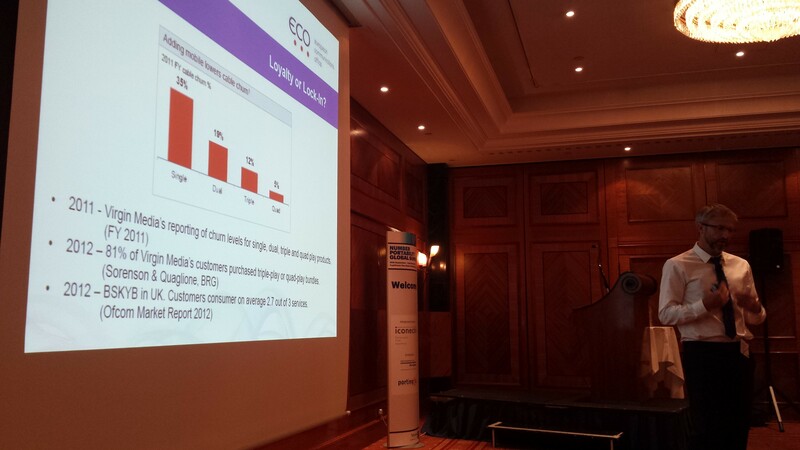 Idiro is delighted to have been invited to speak at the Number Portability Global Summit in London in September 2013. Idiro will be sharing its experience of the impact of number portability on mobile customer retention and on trends in mobile number porting by Idiro’s customers across the world. Idiro’s speaker, Mr. Simon Rees, has also agreed to chair the second day of the conference. Idiro has worked with a number of mobile operators worldwide to manage the increased churn that comes with the introduction of portability into mobile markets and to help them profit from the customer acquisition opportunities that MNP introduction brings. Said Georgina Hajdu, Director – Telecoms IQ, IQPC: “We are delighted to have Idiro share their expertise in mobile number portability at our Global Summit. We are sure our attendees will benefit”. For a detailed description of how Idiro can help mobile operators capitalise on mobile number portability (MNP), or for a discussion with Idiro MNP experts, please contacts us at experts@idiro.com. Telecoms IQ deliver carefully focused, operator-led conferences that provide cutting-edge case studies, open discussions, practical knowledge transfer and invaluable networking opportunities. Website: www.telecom-iq.com. Mobile number portability (MNP) is being rolled out by telecoms regulators across the world. Simply put, MNP means that a mobile phone user can switch providers and keep her/his number. And when MNP is implemented in a country, it always results in an increase in churn. This represents a huge challenge for the mobile operators. Idiro can help. Idiro has helped mobile operators in a number of markets to deal with the challenges of MNP. We help operators to minimise MNP churn and to target the right customers for acquisition, post-MNP. Using Idiro’s Social Network Analysis (SNA) technology we use mobile operator call records (CDRs) to build a social graph of the mobile phone users in the country. Using Idiro’s proprietary technology we then identify those at greatest risk of churning and porting their number, and also those customers of other networks who are most likely to join our customer’s network. We set up an ongoing programme to provide these target lists every week. Finally, our consultants work with the mobile operator to build the best campaigns to profit from MNP. Idiro’s long experience of mobile number portability projects and our total dedication to customer satisfaction mean that mobile operators can sleep easy at night. For a detailed description of how Idiro can help mobile operators capitalise on MNP, or for a discussion with Idiro MNP experts, please contacts us at experts@idiro.com. We wish our blog readers a happy new year. OFCOM, the UK communications regulator, has just released its latest report on complaints about major telecoms providers in the UK. Some operators attract far more complaints than others. Of the mobile operators, Three UK attracts a consistently high level of complaints, while O2 UK customers tend to complain the least. This is an impressive achievement for O2. One big problem with complaining behaviour is that it’s contagious. 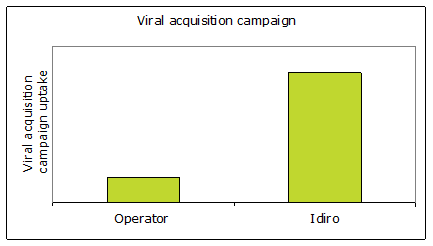 Idiro carried out a study recently for an Asian mobile operator on the viral spread of complaining among their customer base. 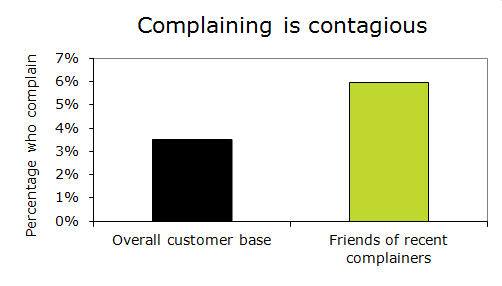 The study found that friends of complainers were far more likely to complain themselves than the overall customer base – so it seems that complaining can cause your friends to complain too. This tallies with the findings of numerous surveys that report consumers more likely to share negative experiences with their friends than positive ones. This survey, for example, reports that consumers tell an average of nine people about good experiences, and 16 about bad experiences. 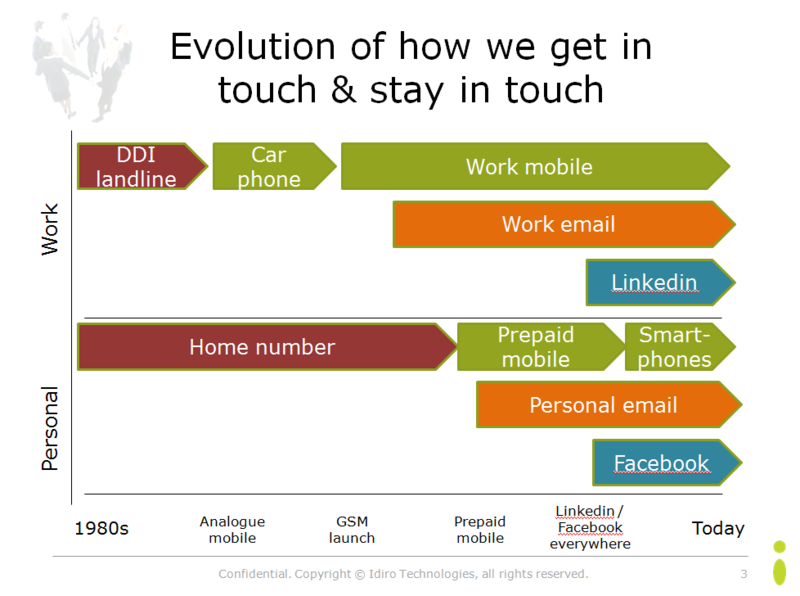 The ease of communication brought by web 2.0 and ubiquitous mobile communications is only increasing those numbers. So what to do about it? The obvious answer is to offer a service that eliminates all need to complain. However, even if it were feasible (it’s not), such a strategy might not serve the interests of the company’s shareholders. Finding and fixing the major causes of complaints is a good place to start and is at the heart of this year’s trendy buzzword in marketing, Customer Experience Management. But this is clearly not enough. Idiro recommends that businesses focus also on identifying the influencers on your customer base. The top 10% of influencers typically have three times more influence that the average customer, according to studies carried out in many markets. Keeping these influencers happy will help cut off the contagion of complaints at the source. For those businesses with link data (telcos, multiplayer gaming companies, online social networks, etc. ), Idiro can find the relevant influencers. Then your business can deploy the tools to give them a happy customer experience, increase their loyalty and decrease complaining and churn.